Home BUSINESS MTAANI NEWS Police forced to lob teargas to separate two warring matatu Saccos. Police forced to lob teargas to separate two warring matatu Saccos. 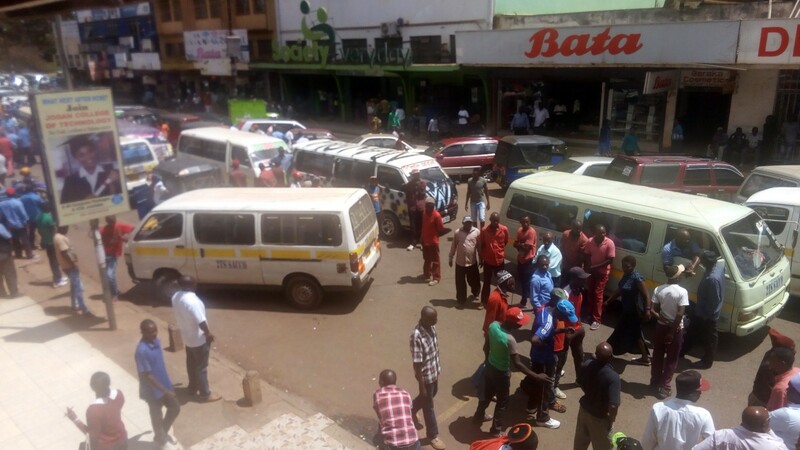 Rival matatu crew from 2TS and 254 Finest Saccos confront each other as they block any access to Commercial Street on Tuesday afternoon over dispute on termini. Police were called upon to quell a possible ugly backlash after shoving broke out between 2TS Sacco and 254 Finest Sacco (Nganyas) crew over termini. It all started at around 2pm when 2TS matatus blocked a section of Commercial Street to protest what they referred to as their rivals of illegally allocating themselves a matatu parking next to the former December Hotel, just right opposite Society Stores. They accused 254 Sacco of hijacking ‘their’ customers before they reached their Whiteline stage. In reaction, 254 Sacco crew mobilised their troops and a standoff ensued, leading to an exchange of some blows and name calling. The impasse paralysed that section of the CBD, bringing to a standstill, any movement of vehicles for more than two hours. It was when the situation was about to get ugly that officers from Thika Police Station were called in but their plea to have the vehicles removed from the road fell on deaf years. When dialogue failed, the police were forced to lob teargas canisters to disperse the warring groups. Shops were hurriedly closed and resident ran helter-skelter for safety. Within a short while, order was restored and the matatus cleared from the road. Leaders drawn from the two groups were summoned to the OCPD’s office to seek a solution to this problem. Both 2TS and 254 ply the Thika-Makongeni route. “These people have survived in monopoly for the last 40 years and do not want anyone else to venture into this business. That is why they always crush any new entrant for fear of competition,” shouted Samuel Kiarie, the 254 Sacco Chairperson. “We are warning them that we will not relent until we too are recognised as bona fide stakeholders in the Thika matatu industry. Where do they want us to get money to feed our families? If the worse goes to the worst, we will fight to the last drop for our right to do business,” he added. Kiarie accused the county transport committee of dilly dallying with their decision to allocate them a park to operate from, accusing them of favouritism and bias when it came to dealing with upcoming Saccos that were less endowed financially. However, 2TS chairman Michael Kamande denied the allegations saying that his Sacco was never opposed to the new entrants but were against the manner they patched a termini without following the laid down procedures. “These are our children and we are happy when they progress and earn a decent living. However, we have a transport committee in place that allocates spaces to PSV matatus and we cannot allow everyone to just set up matatu termini all over the town. There must be order,” said Kamande. A crisis meeting held later at the Thika OCPD office under the chairmanship of the Thika West DCC Tom Anjere resolved that 254 Finest Sacco surrenders the spot they had allocated themselves and instead, use the space between the police station and Nellion Centre as their passengers’ drop out point before driving towards the stadium roundabout where they can now carry passenger right opposite Vineyard Hospital (Kwa Dr. Wachira). “This is just a temporary measure as we seek a lasting solution to the whole issue,” said the DCC. Christopher Wanjau, the Regional Sub-County Admin and the officer in-charge of Thika transport committee assured the 254 Finest Sacco that they will soon be allocated a place to operate from. “Once we are through with all the logistics, we will surely allocate you some space within the CBD. This is after we reorganise the entire transport system with special emphasis in decongesting the town,” said Wanjau. The fight for passenger between the two Saccos is not new with the recent case being last Sunday when the clash between them resorted to 254 Finest crew lighting bonfires at various spots within town in a bid to force their rivals from operating.